Attendees at the Academy’s Annual Meeting and Public Policy Forum, held Nov. 1–2 in Washington, D.C., enjoyed a full program that covered a number of key health issues, including updates on the Affordable Care Act and the latest on long-term care insurance. Former Academy Health Vice President Geoffrey Sandler received the Jarvis Farley Service Award, and Karen Bender, a member of the Individual and Small Group Committee and the Prescription Drug Work Group, was a recipient of the Outstanding Volunteerism Award. Click here to see all topics covered during the health sessions. The Health Practice Council released a new public policy research study, Estimating the Potential Health Care Savings of Reference Pricing, based on the Academy’s new research on this topic, at the Annual Meeting and Public Policy Forum. 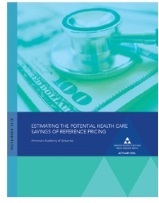 It examines the potential savings in health care spending from an expansion of reference pricing to a broader range of outpatient and inpatient health care services, along with factors that could hinder savings. Steve Jackson, the Academy’s assistant director for research (public policy), was a primary drafter of the study, and led a spirited breakout session at the Annual Meeting. Those who were unable to attend can watch a replay, which was livestreamed on our Facebook page. The Academy hosted a Capitol Forum webinar on Oct. 25, “Updating CBO’s Health Insurance Simulation Model” (HISIM). Speakers from the Congressional Budget Office’s (CBO) Health, Retirement, and Long-Term Analysis Division provided an overview of the CBO model used to generate estimates of health insurance coverage and premiums for the U.S. population under age 65. The webinar was moderated by Academy Senior Health Fellow Cori Uccello. Speakers gave details on improvements to HISIM and discussions with attendees gave CBO valuable feedback. The congressional agency—which is planning to use its updated model to develop its spring 2019 baseline projections and subsequent cost estimates—is incorporating feedback obtained during presentations like the Academy’s webinar while the new model is in the development and testing phase. Slides and audio are available free. More than 100 people attended the Academy’s sold-out Life and Health Qualifications Seminar Nov. 4–8 in Arlington, Va. Now in its 18th year, the seminar and its interactive sessions have been highly valued by attendees, with many returning every few years to brush up on skills. Actuaries who attended the seminar had the opportunity to acquire required basic education and continuing education to be qualified to sign statements of actuarial opinion (SAOs) for NAIC Life and Health annual statements. It is an effective way to earn continuing education credits under the U.S. Qualification Standards for those who already have the basic education needed to issue such SAOs. Academy President-Elect D. Joeff Williams chaired the committee that organizes this seminar. On Election Day, Nov. 6, ballot initiatives were approved by voters in Idaho, Nebraska, and Utah to expand Medicaid coverage to working-age adults with incomes below 133 percent of the federal poverty level. Voters in Montana rejected a related initiative to permanently extend the state’s Medicaid expansion. Read the Academy alert. Maine voters rejected a ballot initiative that would have established a universal home care program for adult residents, regardless of income level, who need help with one or more “activit[ies] of daily living.” The proposed program, which also includes stipends for family caregivers and funding for home health care workers, would have been funded by a 3.8 percent tax on nonwage income and wages that are not subject to the Social Security payroll tax. Read the Academy alert. California voters rejected a ballot initiative that would have set a cap of 115 percent of the costs of patient care on dialysis clinic profits, and to provide rebates to insurers for revenues above the cap. Read the Academy alert. The Centers for Medicare & Medicaid Services (CMS) Center for Consumer Information & Insurance Oversight (CCIIO) released on Oct. 26 public use data on health insurance exchanges and rates for 2019. The data includes health insurance exchange public use files and rate review data. Read the Academy alert. President Trump signed a bill into law Oct. 24 aimed at addressing the opioid crisis through a range of strategies, including accelerating research on alternative painkillers, targeting international shipments of illicit opioids, funding grants for substance abuse programs, and allowing Medicaid coverage for inpatient facility treatment. Offsets on spending in the bill include requiring brand pharmaceutical manufacturers to disclose to the FTC patent settlements with generic drug manufacturers for biosimilars, standardizing the percentage that Medicaid Managed Care Organizations are allowed to spend on administrative care, and revising reporting requirements for prescription drug coverage under the Medicare Part D Program. The U.S. Treasury, Health and Human Services, and Labor departments released a proposed rule on Oct. 23 to expand health reimbursement arrangements (HRAs). The proposed rule follows an October 2017 executive order calling on the departments to explore the expansion of HRAs, as well as association health plans (AHPs) and short-term, limited duration (STLD) insurance plans. Read the Academy alert. CMS and the U.S. Department of the Treasury announced new guidance on Oct. 22 that the departments say is intended to allow states greater flexibility in designing and managing their individual insurance markets. The guidance makes several changes to requirements for waivers issued under Section 1332 of the Affordable Care Act (ACA). Read the Academy alert. Washington state’s Office of the Insurance Commissioner adopted a final rule on Oct. 17 limiting STLD plans to three months, rather than the 364-day period allowed under federal regulations adopted in August, and establishing minimum coverage standards and disclosure requirements for STLD plans. The rule is intended to clarify that STLD plans are intended for stopgap insurance coverage, and that they not be considered as a substitute for comprehensive health insurance. The Washington Post quoted Barb Klever, chairperson of the Academy’s Individual and Small Group Markets Committee, on how reinsurance programs can diversify risk pools by attracting new, unsubsidized people, which can make the risk pool become relatively healthier. In a subscriber-only Bloomberg BNA story, Senior Health Fellow Cori Uccello discussed the impact of regulatory changes on ACA exchange-plan health insurance premium rates for 2019. A new Congressional Research Service report, The Patient Protection and Affordable Care Act’s (ACA’s) Risk Adjustment Program: Frequently Asked Questions, cited several Academy resources, including an issue paper, comment letter, and health care issue briefs addressing 2017 premium drivers, 2018 premium drivers, and high-risk pools.